Load the dirt. Load the dirt. Scoop and swing and drop. Slam it down into the truck. Bump! Whump! Whop! 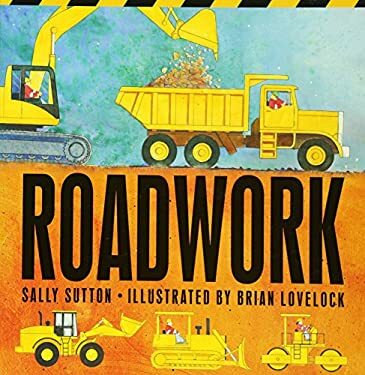 There are many big machines and busy people involved in building a road, and this riveting board book follows them every step of the way. From clearing a pathway (screek! ) to rolling the tar (squelch! ) to sweeping up at the end (swish! ), Roadwork is sure to delight young truck-lovers with its rambunctious rhymes and noisy fun.